Projection artist and digital art specialist Ross Ashton of London based The Projection Studio has created three new son et lumière shows for Colchester Castle, UK, comprising a projection onto the Castle’s internal wall, accompanied by soundtracks created by sound artist Karen Monid. Ashton was approached to produce the show following his work at Caerphilly and Norwich Castles plus other heritage projects, where his video projections have depicted building histories in visual and informative narratives. The brief was to produce something memorable that would motivate visitors to discover more about the Castle. “The challenge was picking historical moments that would translate to large format projection and encapsulate the Castle’s story in a short timeframe,” Ashton says. The three AV segments are each three minutes long: The first explores the early origins of the building; the second details the site being re-developed as a Norman fortress; and the third is an overview of the Castle’s activities and uses from the medieval era to the present day. 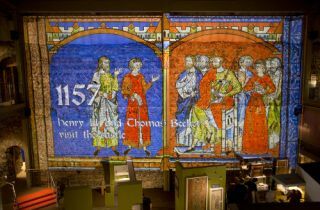 All the content was produced by The Projection Studio, with original materials sourced from the Castle Museum’s own extensive archive. The 3D animations were created by Sang Gun Kim and the 2D work was completed by Thierry Noyer under Ashton’s art direction. Along with creating the stories, Ashton designed the projection system, with a Panasonic PT-DW17K at the center, fitted with a 0.6 short throw lens. The projector is attached to the celling via a bracket and projects an image that is 15 metres wide by 10 metres tall. The projector was chosen for its compact size and four bulbs, and for its quality and cost-effectiveness. The physical installation was completed by Sysco AV. Karen Monid created a bespoke sound piece to accompany each different story, matching effects and sound elements to the visuals happening onscreen. For the first story, Monid included a recording of a Latin prayer, recited by a scholar in ancient languages, adding subtle musical enhancements of her own. The second Norman story features a soundscape of medieval construction. For the third show, the technique is more abstract. Following a timeline, the sound includes atmospheric sounds of battles and incarcerations, spoken text, and modern rhythms that join the piece together. The challenges included making the sounds authentic to the period. The installed sound system is also able to emphasize certain audio effects from the exact spot that the action is taking place on the project picture.